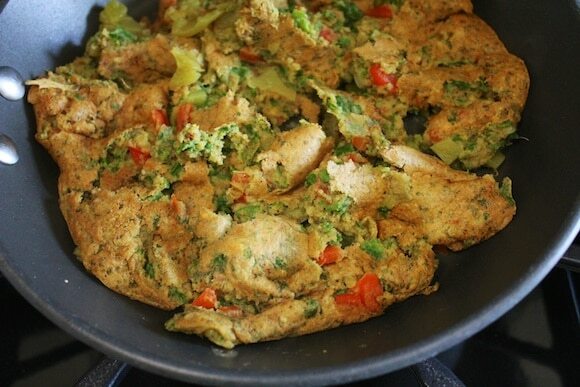 This post shows you how to make a vegan egg-free and gluten-free chickpea flour omelet. 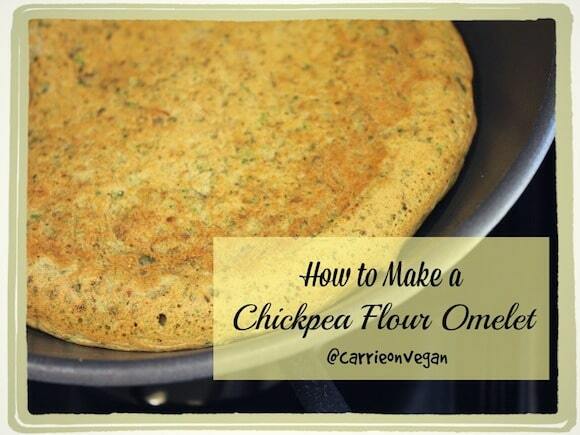 What is a Chickpea Flour Omelet? I have also seen this dish called socca or pudla which I understand to be of Mediterranean origin. 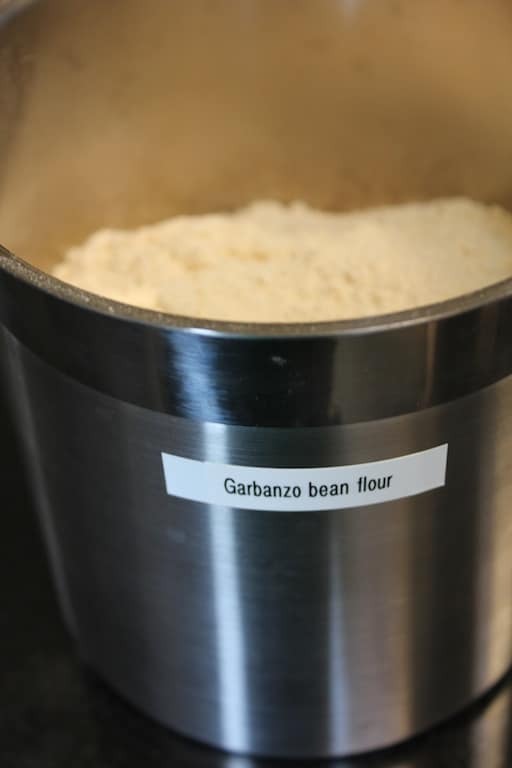 No matter the name, the base of this high-protein, fiber-rich, and plant-based dish is made from chickpea flour, also known as garbanzo bean flour. The nutritional profile of the flour is fantastic, it is high in protein, iron, and fiber. 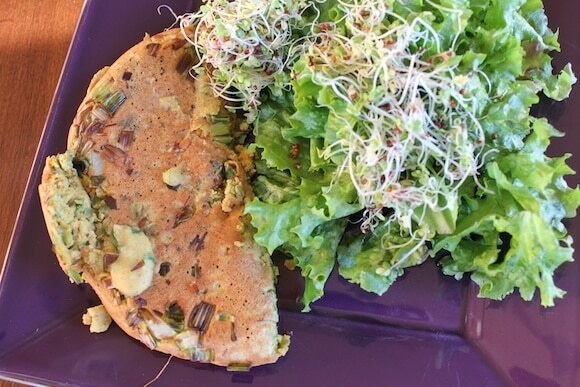 Note: you can buy sprouted chickpea flour, too. My recipe uses a mixture of the flour, baking powder, water, herbs, and whatever vegetables you want. 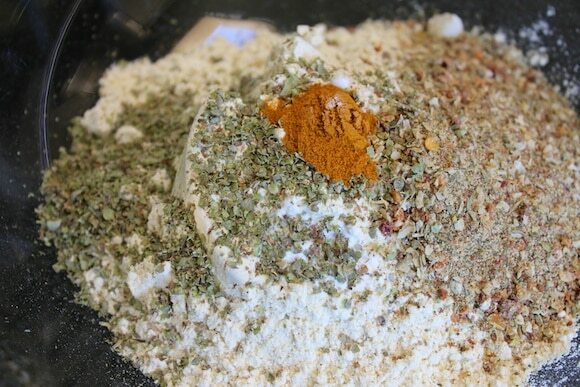 I start out by mixing the dry ingredients. I like to get whatever vegetables I am going to use ready at this point. 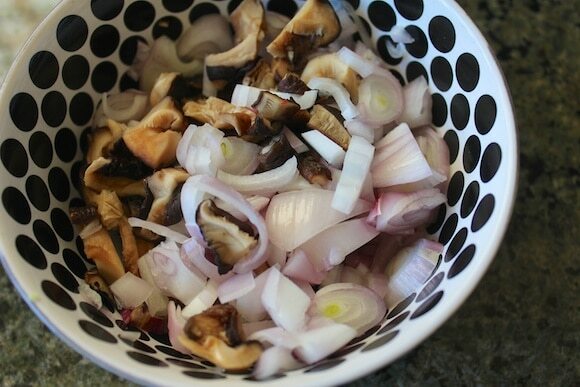 I especially love shallots and mushrooms in my chickpea omelet. Combine chickpea flour, baking powder, dried turmeric, no-salt seasoning or dried herbs, and nutritional yeast in a medium-sized bowl. Add water and lemon juice and use a whisk to stir together, getting rid of any clumps. Stir in minced shallot, chopped mushroom, and chopped kale. The consistency of the batter should be pourable and not too thick. Add 1-2 tablespoons of water and stir again, if necessary, to achieve the proper consistency. Spray a medium skillet lightly with coconut oil and heat on medium. You can use two skillets if you want to make and serve both omelets at the same time. Pour half the batter into your skillet. Place a lid over the pan to help it cook faster. Reduce the heat to medium-low and let the omelet cook for 3-4 minutes. Once the top of the omelet has started to cook, use a spatula or a plate to help flip the omelet onto the other side. If your batter sticks, then you can always make it into a scramble, using a spatula to scrape the batter off the bottom of the pan. 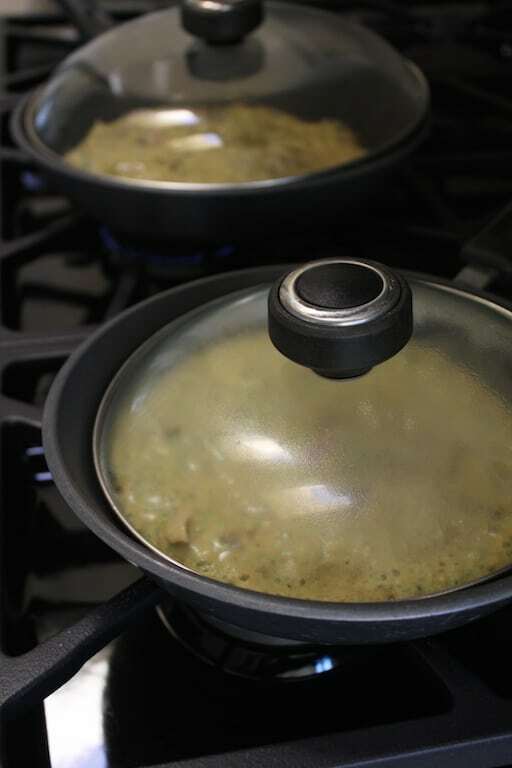 Reduce the heat to low, place the lid on the pan, and let it cook for another 4-5 minutes (if making a scramble version, then it will cook faster, maybe another 2-3 minutes). Serve hot, topped with a bit of sea salt, if desired. 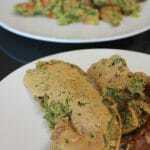 Is this Chickpea Flour Omelet new-to-you as well? Do you have a favorite version? I just discovered chickpea omelettes in the past few weeks and I actually posted one on my blog earlier today! Soo good. The shallots and kale sound like great veggies to put in it! Do you think these could be put into silicone muffin cups and baked? If so, how would you do it? I have clients who do this! I’m not sure how, but I know t can be done. 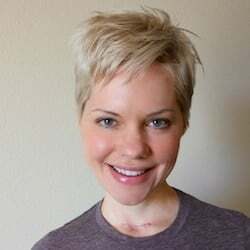 Love the post Carrie, and thanks for the link love. =) This is definitely one of my all-time favorite breakfasts! I will experiment, Shelah, it’s a GREAT idea! Thanks, Carrie! Please let me know how it goes!! I love how quick and versatile chickpea omelets are to make! I recently discovered them too and have made them many times since. Synchronicity! I just made a chickpea pancake yesterday! I love them because they’re a great way to amp up a salad with something from the pantry. I am usually lazy and make a plain version and then put lots of vegetables on top. 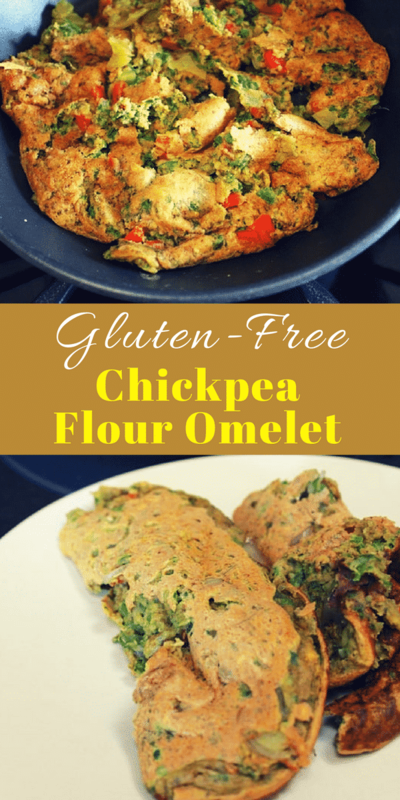 I love chickpea flour omelets! I add a pinch or two of Kala Namak (black salt) which adds a distinctive eggy (slightly sulphury) flavor which is so good. 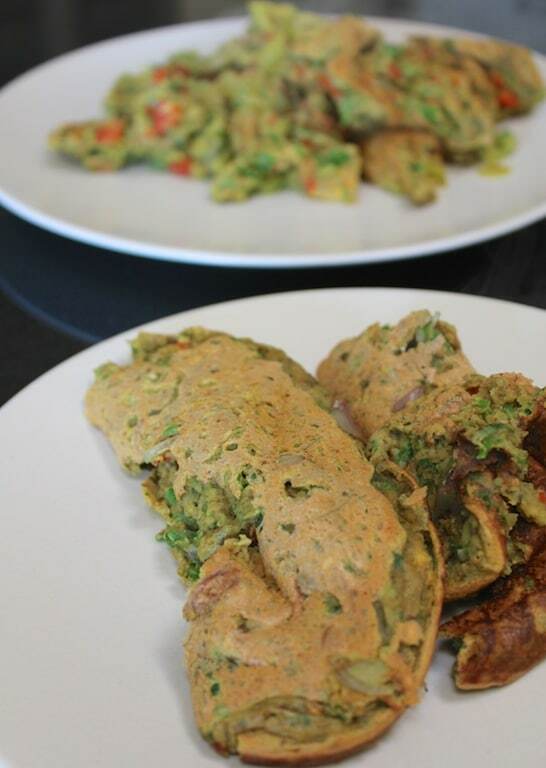 I have also used chickpea flour to thicken sauces or gravies as an alternative to grain flours (and much healthier too) ! Oh… And I use A label maker for everything in my pantry also. ROCK ON! Looks delicious… this is on my “to cook” list! Great, let me know what you think of it! I’ve been making an omelette just like this for a few months now for breakfast or as a pantry dinner. So versatile! 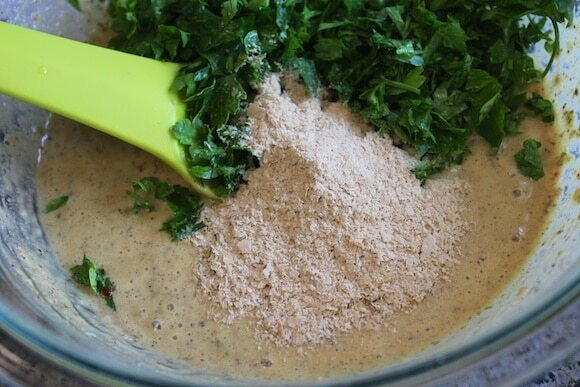 I add flaxseed and vital wheat gluten and makes it a bit thicker. i just made this for lunch right now! 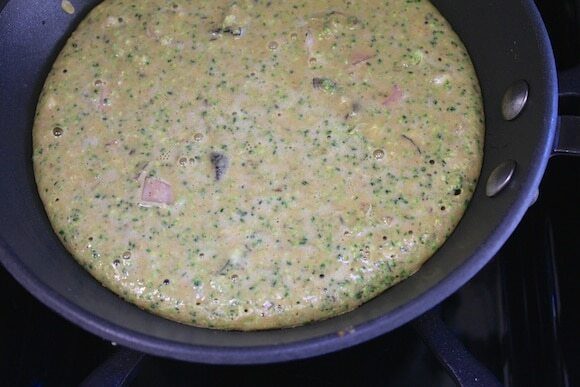 I make socca pretty regularly, will have to try this omelette version! Those vegetables and spices that you used look DIVINE! I’m so into chickpea flour for all sorts of goodies these days, especially Pudla! I like eating mine with fresh sprouts too! Mmmm I love chickpea omelets. I’ve never tried a scramble though – what a fun idea. I wasn’t in love with the last recipe I tried, so I’d like to give this one a try. I tried the recipe yesterday, and I really messed it up badly. One, it had lumps and I probably did not add the liquid slow enough. Two, I didn’t add enough water and it was too thick to spread out. Three, it stuck to the pan. On the other hand, it tasted good and was quick and easy. Next time, I will make some corrections and use a non-stick pan. Hey Carrie, I used to be a regular chickpea flour omelet maker but have fallen out of practice. Your recipe looks like a great one – love the simple ingredients list and that it’s soy-free. It seems like so many recipes add all kinds of extras in! Is this going in the Vegan Delish app? Hint hint 😉 Can’t wait to try it – and I use your app as my go-to! I tried this today and it was great. Thank you for posting. I never use oat flour, just sub another tbsp of ground flax. I’ve never actually put the veggies in the omelette. I like to sprinkle them on top and fold the omelette over so it looks more like a traditional omelette. I also love adding a little Daiya or avocado on top for some creaminess. Made these for dinner and I’m in love! Cheap, easy, versatile and nutrient packed. I folded it in half, filled it with spinach and Olive hummus and for good measure I grilled it in my panini maker to get everything all smelty and topped it with salsa. I wasn’t brave enough to try to flip it in the pan haha. Delish! Thanks! Awesome and I loooove your idea to finish it in a panini maker!!! Thank you for posting this recipe. It’s great! I recently discovered the chickpea omelet on the menu of the Duluth (MN) Grill menu. It was amazing and inspired my search for a recipe. I made your recipe as is – but did not add the veggies to the mixture – instead I served the omelet with a spicy veggie filling. I am excited to experiment with this recipe. I can’t believe I didn’t know about chickpea omelets until now. I appreciate all the ideas in the comments. Thanks. Such a great vegan omelet option!